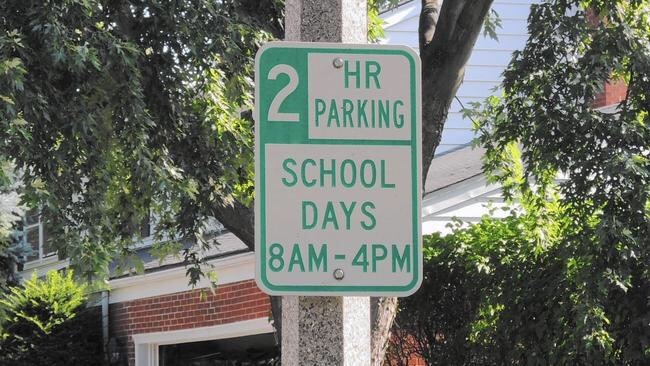 ELMHURST – An ordinance expected to be approved by the Elmhurst City Council later this month to prevent York High School students from parking on Mitchell Avenue could lead to over-crowded sidewalks, a sharp rise in school bus usage, and a dramatic ego-blow to students who feel they are “too cool” to walk or ride the bus to school, according to assistant principal Drew McGuire. Aimed at appeasing Mitchell Avenue residents concerned with the safe maneuverability of emergency vehicles, landscapers, pool cleaners and furniture store delivery trucks down a street normally lined on both sides with parked cars during the school year, the ordinance calls for a 2-hour parking limit on Mitchell between St. Charles Road and Eggleston Avenue during the hours of 8 a.m. to 4 p.m. on school days. Early feedback from York students confirms McGuire’s assertion. “I was counting on a boost to my social status this year based on driving my dad’s Range Rover every day,” said senior Parker Schultz, who stated that he typically rode his skateboard to school last year and actually lives closer to York than the Mitchell Avenue side street. Students who live further away from York expressed concern over relearning the etiquettes of riding on a school bus. Assuming the ordinance is officially approved during the next City Council meeting on August 15th, signs would go up on Mitchell August 16th, the day after school starts. You are a bunch of over privileged students. Get a grip and take the bus or walk you might meet someone new or get some exercise. I took the bus all 4 years and never needed therapy. Parents stop supporting the Ming set that your child is privileged. Patricia, this is a satire blog and while the story about limiting parking is true, the rest is made up : ). Truly though the ppl here are somewhat Entitled, I wondered about the truth of it. hahaha.